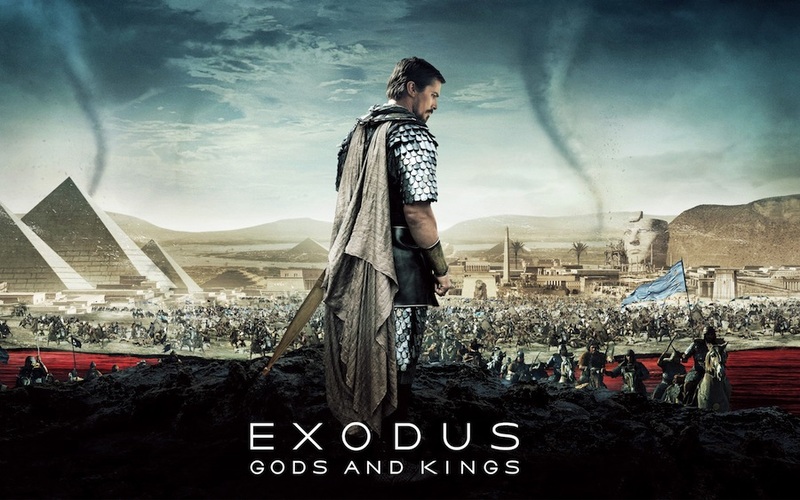 Exodus–the story of Moses–proves beyond a shadow of a doubt that atheists make the best Bible movies (see my review of Noah). I don’t know that atheists necessarily make the best contemporary movies about faith or people of faith, but they certainly do the oldies well. Perhaps this is in part because they mine an amazing text/source that believers might take at face value and/or are afraid to delve to deeply into. Also, atheists are hungrier than us spoiled, slothful believers who take everything for granted. Simply having faith doesn’t mean we have mastered the human depths of a Bible figure’s journey. That’s pretty much open to anyone. To do a Bible story well, an atheist filmmaker must suspend their own disbelief and ask “what if”? I think Ridley Scott has done that here. Like a Boss. Like Bosses. Does Christian Bale pull it off as Moses? Oh yeah. At first, I disliked his trim little facial hair and cropped-but-artfully-tousled hair that didn’t look like it fit the era, but it leaves him room for growth and aging. Bale is Welsh and Edgerton is Australian, and it just shows. Americans are too American and the British are too British. I’m really digging these other-accented male actors (include New Zealanders) for the Big Roles (although Brooklyn-born John Turturro as Seti, Ramses’ father, made me forget all his other, often humorous, deeply American roles). 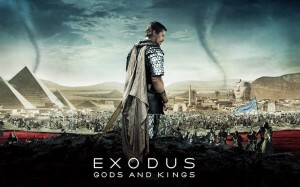 In general, this is a well-made film, part of a new generation of Bible films. I am thrilled that our visually-oriented youth are being treated to these nouveau masterpieces. Most young people have not seen any of the older Bible films or lives of Christ. Ridley Scott mesmerizingly pulls us through visual sequence after visual sequence of battles and plagues. I’m not usually one for epic films with wars and lots of noise and action, but Scott is a genius and is really moving the story ahead through the action-reactions of characters to these grandiose, sweeping events. There are a few scenes that could have been re-shot. The actors looked like they were trying to remember lines, weren’t sure how to play the scene, or it just wasn’t their best take. Dude. Just reshoot. But these are my only complaints. It’s a great film. Although the Bible is an “ancient” text about ancient times and peoples, human nature doesn’t change, and so Exodus has a contemporary feel. I could totally relate to Moses as he struggled to relate to God. I loved seeing this incredible, incredible man of God questioning, fighting with and arguing with God. Remember, Moses saw God. He did so many epic things like, oh, leading the Hebrew people to freedom after four hundred years of slavery, parting the Red Sea, the Ten Commandments, etc., etc. But I love how the film starts him off as a skeptical, practical man with no faith. The film has ample room for God as a huge player, a huge character. In fact, God makes it abundantly clear that once Moses has obeyed (a very creative, two-way-street type of obedience), God will do everything. In a colossal way. I couldn’t help thinking of the Easter Vigil liturgy and Fathers of the Church that rely so heavily on the imagery of the Exodus for celebrating Baptism and the Redemption: freedom, transformation through water, the Passover. The supposed cruelty, arbitrariness, and unreasonableness of God is also dealt with–and not just that of the Hebrew God, but that of the gods of other peoples in the region. That there IS a diety(ies) is assumed, taken for granted, obvious, almost unquestioned . But just what this God is like is hotly debated: “What kind of God would…?” Would that we had these same questions today! This is a very male movie. Women barely play a part. Sigourney Weaver is miscast as the young pharaoh’s mother, Miriam has two small (albeit significant) scenes. Zipporah, Moses’ wife, is truly the love of his life, but we see so strongly how faith, leadership, the direction of tribes, nations and history is patriarchal. As I will always maintain, patriarchy–although a system massively open to massive abuse–is not evil, and in a certain sense, God has ordained and used this system throughout salvation history (it’s also deeply rooted in simple biology but has nothing whatsoever to do with superiority–just a different task in life than women). It is up to men and women (with the onus on women) to bring to light and emphasize the unique identity, heroism and essential contribution of women throughout history and salvation history. And we do not have to do this in a strident way, just a firmly insistent, truthful, and complementary way. It is up to us women to read the Bible with women’s eyes and see all the amazing strong women of God everywhere in the Bible–and imitate them. And yes, much of this revolves around motherhood and the protection of vulnerable human life (um, what could be more noble and important)? Men, too, are called to protect vulnerable life, but they do it in a different way. One more word about patriarchy and the absolute need for good men. For good men to lead. When good men lead, women and children flourish. I hope that men in particular will feel called to a deeper, truly masculine relationship with God through this film. I hope audiences will sit back and consider their own wrestling with God, their own prayer life, their own dilemmas and choices alongside those of Moses. Enter into the story with their own story. I received tremendous insight through this film. Many years ago, I was told by a Jesuit spiritual director that I could “negotiate” with God. “What? !” said I. “What do you think Abraham and Moses did?” he asked me. This conversation changed my life and my relationship with God forever. Of course, the Jews already understand that as they have continuously and intimately wrangled with God and kept their conversation with him going for millennia: collectively and individually. This bargaining with God is not meant to be a venal begging for things or circumstances that we want, but as intercession for the good, for others, to become better people ourselves. Although not all of Moses’ life is covered in this film, I was reminded of him so often “standing in the breech” for others. There’s a touching and tender scene regarding the Ten Commandments where it is evident that Moses is still free at every step to agree or disagree with God. And of course, by this time, the fiery Moses had become “by far the meekest man on earth” (Numbers 12:3). There is much explicit talk about “faith” in this film, but little about love (beyond familial love). Of course, for men, love is often summed up in silent deeds. If a man loves you, he’ll mow the lawn and fix your car but never think to say: “I love you.” Again, think St. Joseph who says exactly nothing in the Bible. I wonder if Scott was toying so much with faith that he forgot about the great love of God for Moses and Moses for God that motivated everything. Or maybe it is just implied. At UCLA, we were taught that in all good screen love stories, “I love you” must be shown in a plethora of different ways whether or not it is ever voiced.